Resistance is futile: You will see the trailer for Avatar, one way or the other. So you might as well just watch it here -- or down there -- and get it over with. Just in time for Halloween, the great film director and historian gives us -- appropriately enough, at The Daily Beast -- his list of the 11 scariest horror movies ever made. Oddly enough, Night of the Lepus did not make the final cut. 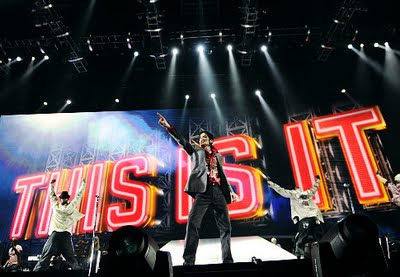 According to Variety, Michael Jackson's This is It grossed $2.2 million last night. Shazam! And He wouldn't want Congress to stop funding ACORN, either. The folks at Brave New Films explain it all to you here. A light, bright romantic comedy... from Vietnam? Well, actually, from a filmmaker born in Los Angeles to Vietnamese emigres. But Passport to Love was filmed largely on location in Saigon -- which, it should be noted, no character in the film ever refers to as Ho Chi Minh City -- and Orange County, California. After attracting audiences and winning awards in Vietnam, this polished Viet-U.S. co-production is slowly finding a following Stateside. 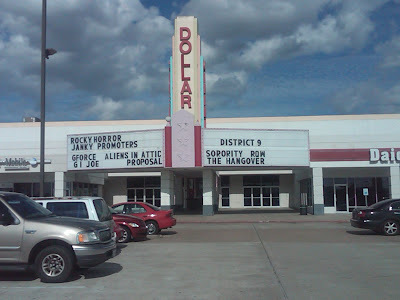 I saw it a few nights ago at a Houston area megaplex, where it's been running for nearly three weeks, and noted that even a midweek screening could draw a respectable number of young Asian couples. My Variety review can be found here. 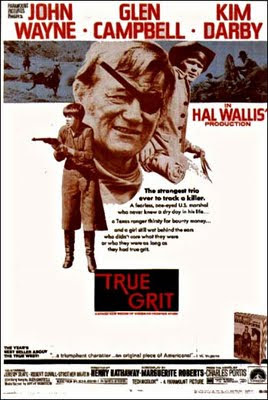 Look like all those rumors about a remake of True Grit... aren't just rumors. According to Variety, filmmakers Joel and Ethan Coen are scheduled to start production next March -- for a late 2010 release -- with Jeff Bridges (a veteran of the Coens' cult-fave The Big Lebowksi) filling in for John Wayne as grizzled lawman Rooster Cogburn. Matt Damon reportedly is "in talks" to co-star as the Texas Ranger played by Glen Campbell in the original 1969 film -- which, like the remake, was based on a novel by Charles Portis. And Josh Brolin, who figured prominently in the Coens' Oscar-winning No Country for Old Men, may sign on to play the chief villain of the piece. No word yet on who will portray the feisty young woman played in the '69 original by Kim Darby. When I asked the Coens about this project last month -- during round-table interviews for A Serious Man at the Toronto Film Festival -- they insisted that their version will be “more faithful” to Portis’ novel than the film that helped The Duke win his one and only Academy Award. And, hey, maybe it will. To be honest, the '69 picture wasn't exactly a classic. And, to be even more honest, Wayne deserved an Oscar more for She Wore a Yellow Ribbon and/or The Searchers. But, dang, try telling any of that to the diehard fans who are bound to squawk no matter how good the Coens' remake will be. Don't get me wrong: I love the idea of Ricky Gervais doing to the Golden Globes for two or three hours what he's done to the Emmy Awards as a presenter. But do members of the Hollywood Foreign Press Association really comprehend who they're dealing with here? If you want a good idea of what they (and we) likely are in for, check out this YouTube clip -- a teaser for Cemetery Junction -- and imagine Gervais sporting the same 'tude for the entire Globe telecast. Hey, I know I'll be watching. I cannot begin to tell you how seriously bummed I am this evening to hear about the passing of Soupy Sales -- an icon of my misspent youth, a splendiferously uninhibited and unabashedly slapsticky comic great I would place in the pantheon alongside The Three Stooges and Abbott and Costello. Many were the happy hours I spent with him, White Fang, Black Tooth and Pookie the Lion -- and, of course, so many, many pies -- during his telegenic heyday in the '50s and '60s. His on-the-air, over-the-top shenanigans were the stuff of legend. Literally. Just look at the above clip, and you'll understand what I mean. Do that, and I'll love you, and give you a great big kiss. Mmm-whaw! Diehard fans of Michael Mann's classic Crime Story TV series will always remember actor Joseph Wiseman as Manny Wisebord, the cold-hearted mob boss who received an experimental heart transplant. 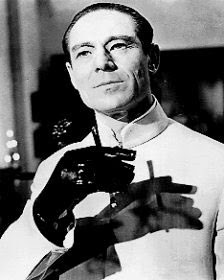 But everybody else -- well, OK, everybody, period -- will remember him best as Dr. No, the eponymous archvillain of the very first big-screen 007 adventure. Sometimes, all it really takes is a single role in a singular movie to ensure an actor a kind of immortality. 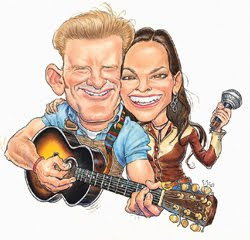 Joey + Rory are a fun couple of Country music singer-songwriters -- with, as you tell from this witty music video, a healthy sense of humor about their unabashedly old-fashioned approach to music. I interviewed them at the Country Music Hall of Fame last June during the CMA Music Festival in Nashville. And you can read the Q&A piece I did for Cowboys & Indians here. As I have said before: In my other life, I'm a cowboy. Specifically, for Cowboys & Indians. 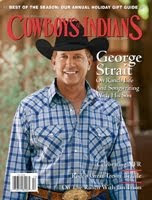 And in the issue on sale now at fine newsstands everywhere, I get to chat with the King of Country: George Strait. This time, it's the New Hampshire Film Festival doing the honors. Next month: Look for That Evening Sun to continue its festival tour at the Starz Denver Film Festival. Somewhere up in movie heaven, William Castle is chuckling heartily and lighting another cigar as he looks at this. 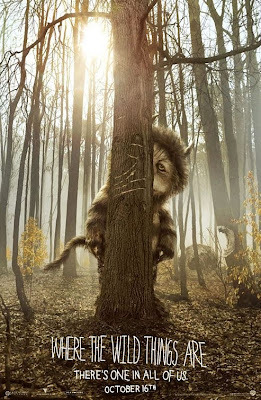 News flash from Miss Nikki Finke: Where the Wild Things Are may be heading toward a $35-million opening weekend gross. Cowabunga. 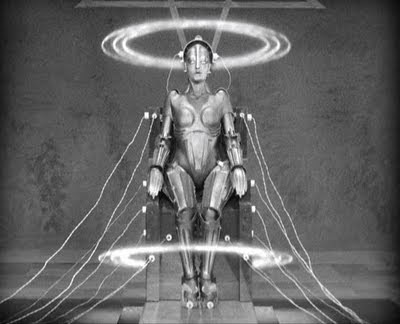 All this melancholy musing has been inspired by the belated theatrical release of Opa! 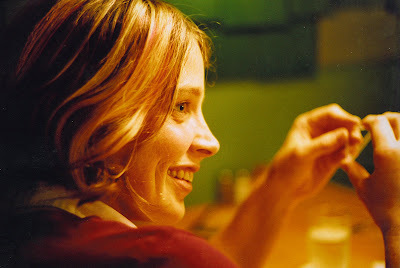 – a lightweight romantic comedy that I reviewed for Variety way back at the 2005 Toronto Film Festival. Modine stars in the movie as a buttoned-down American archaeologist who acquires a lust for life (among other things) during a dig on a scenic Greek isle, thanks to the ministrations of a vivacious young widowed mother (Agni Scott). Call it Zobette the Greek, and you won't be far off the mark. Sorry to hear about the passing of writer Stuart M. Kaminsky, whose intelligent and insightful 1974 book Don Siegel: Director remains carefully positioned on my bookshelf for easy access and quick reference. Indeed, I paged through it just two weeks ago while preparing a lecture for my University of Houston students prior to a classroom screening of Siegel's seminal Dirty Harry. Kaminsky also wrote well-received books about Clint Eastwood, Ingmar Bergman and John Huston. But he remains best known as a prize-winning mystery writer with dozens of novels to his credit. 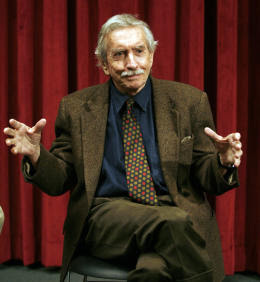 At the University of Houston, Edward Albee teaches playwriting, and I teach Social Aspects of Film. Really, could students possibly ask for anything more for their tuition dollar? Who says the Hollywood junket press never ask any tough questions? Next up on Battle of the Bloggers: Patrick Goldstein gives Jeff Wells the smackdown. You know, I shouldn't take so much delight in this, but, hey, I do. Anne Thompson breaks the news: Terrence Malick's eagerly awaited Tree of Life -- well, maybe not eagerly awaited by me, personally, but eagerly awaited by lots of other folks -- won't be taking root on screens by the end of 2009. The "cosmic epic" had been tentatively set for a Dec. 25 limited release. Some otherwise inconsequential movies are worth at least a passing glance because they provide gainful employment for veteran character actors, allowing them to instructively illustrate the fine art of making something out of nothing while they flex their muscles in thinly written roles. From Mexico With Love is one of those movies. Steven Bauer, Bruce McGill and Stephen Lang are three of those actors. Tilda Swinton, Tommy Lee Jones and Richard Linklater are among the notables slated to appear at the inaugural Houston Cinema Arts Festival set for Nov. 11-15 in H-Town. Organizers insist the event isn't "just a film festival," but rather "a vibrant multimedia arts event breaking out of the confines of the movie theater through live music and film performances, outdoor projections, interactive video installations and more." So there. Whatever you want to call it, this festival is big enough to boast two competing opening night attractions: Linklater's critically acclaimed Me and Orson Wells, which will screen at 8 pm Nov. 11 at the Museum of Fine Arts, Houston; and Lee Daniels' Oscar-buzzed Precious: Based on the Novel "Push" by Sapphire, which will screen at 7 the same evening at the Angelika Film Center in Downtown Houston. You can check out the entire fest line-up here. 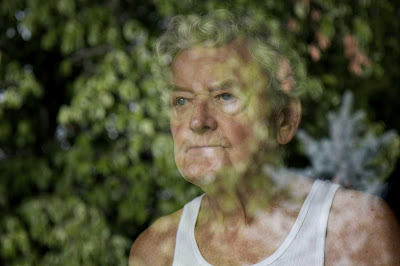 Following a regional premiere screening of That Evening Sun, the critically acclaimed drama in which he gives an Oscar-worthy performance as an aging Tennessee farmer who won't give up his land or his pride, Hal Holbrook will be honored with a richly deserved Excellence in Acting Award Nov. 14 at the Starz Denver Film Festival. And guess who'll be on hand for an on-stage Q&A session with this living legend? Yep: Me. Again. At this rate, we might start touring with our own show. Let's see: How does Mark Twain and His Flunky sound? 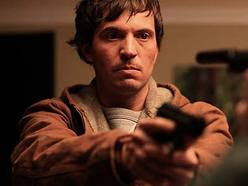 I'm not in the habit of recommending movies sight unseen, but I'm willing to make an exception for Beeswax, the latest indie effort by filmmaker Andrew Bujalski. For one thing, I'm a great admirer of Bujalski's previous feature, Mutual Appreciation. For another: If you see Beeswax at 4:20 p.m. or 7:10 p.m. this Saturday, Oct. 10, at the Angelika Film Center in downtown Houston, you'll be able to talk with Bujalski and lead actress Tilly Hatcher during a Q&A session after each screening. The film itself has garnered raves from such discerning critics as A.O. Scott and Jeffrey M. Anderson, so the odds are good that, if you like this sort of thing, as I do, this is the sort of thing you'll like. Such is the infectious peppiness of Wake Up Sid that, despite an insubstantial storyline that would require a few more subplots to qualify as featherweight, this atypically low-key Bollywood romantic comedy somehow manages to remain pleasantly diverting throughout an unduly protracted 138-minute running time. It helps that first-time helmer Ayan Mukerji has a light touch, but it helps even more that well-cast leads Konkona Sen Sharma and Ranbir Kapoor are so effortlessly appealing – even when the latter’s character is borderline obnoxious. You can read my full Variety review here. Veteran Oscar prognosticator Scott Feinberg has posted his latest projections for this year's glittering prizes. And it looks like, even before anyone has seen it, Clint Eastwood's Invictus is shaping up as a front-runner. 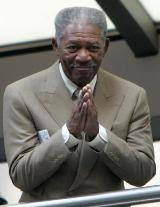 Which will be very good news for my editors at Cowboys & Indians magazine: Award-winning actor and long-time horse enthusiast Morgan Freeman -- who plays Nelson Mandela in the Best Picture contender -- will be the subject of a cover-story profile in the January issue on sale Dec. 8 at fine newsstands everywhere. 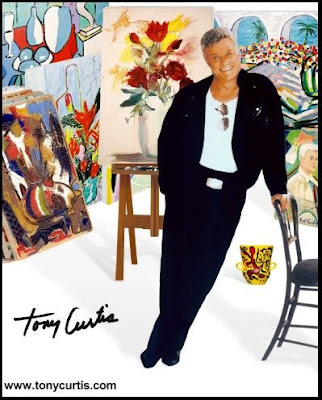 Actor/artist Tony Curtis -- yes, that Tony Curtis -- will be honored with a special exhibition of his original paintings and fine art prints Oct. 7-11 at The Goldenstein Gallery in Sedona, Ariz. It's all part of the gallery's fifth annual Cowboys and Indians show, a month-long event celebrating the preservation of Native American and Western cultures in contemporary art. Curtis himself will be on hand for artist receptions in the gallery Oct. 8, 9, and 11 -- from 11 a.m. to 1 p.m. each day --- and at the 19th Annual Sedona Arts Festival for a book signing Oct. 10. 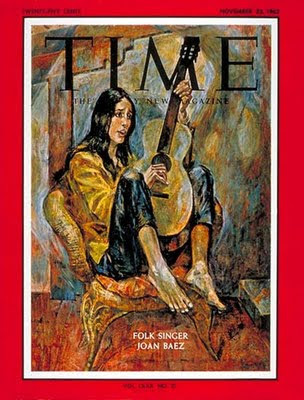 Although it feels more like an authorized biography than an in-depth portrait, Joan Baez: How Sweet the Sound should hold interest for admirers of the renowned singer, recording artist and human-rights activist. Scheduled for an Oct. 14 airdate on the PBS American Masters series after its Toronto Film Festival premiere, this well-crafted documentary also will get wide circulation through its upcoming release as part of a CD/DVD package. You can read my Variety review here. The third feature by Blaine Thurier, keyboardist for the Canadian indie rock band The New Pornographers, A Gun to the Head resembles nothing so much as a senior project by a film-school student who isn't quite as clever as he assumes. 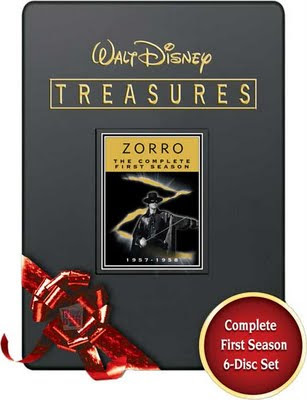 There's an amateurish look to much of this noirish dark comedy -- the blocking of fight scenes is especially maladroit -- and the derivative plot rather too obviously incorporates influences as diverse as Quentin Tarantino, John Cassavetes and Edgar G. Ulmer. 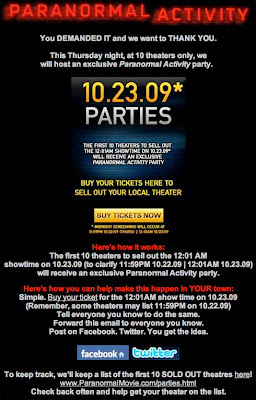 But some of the deadpan dialogue and character eccentricities might amuse indulgent festival audiences and DVD renters. You can read my full Variety review here.